Nottingham City Transport’s (NCT) fleet of 53 ADL Enviro400 City-bodied Scania double-decker buses powered by biogas started to enter service on July 4. The public launch was on May 19 in the old market square in Nottingham with the first few buses on display. The new vehicles are entering service on Green 10, followed by Red 44 and Lilac 24/25 this summer and Orange 36, Sky Blue 45 early next year. As reported in a feature in CBW1292 (May 23), the buses are designed to give a quieter, smoother ride while emitting 83% less pollution than diesel buses. The vehicles are powered by biogas created from gas captured from Nottingham sewage and other waste, producing methane gas. 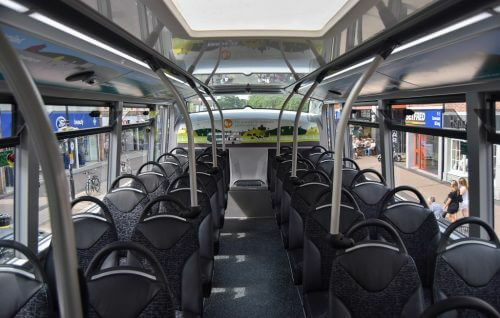 Anthony Carver-Smith, NCT’s Marketing Manager, said: “To see our bio-gas buses finally in operation is incredibly satisfying, and to already have received such brilliant feedback from our passengers really is the icing on the cake. Nottingham-based company Roadgas supplied the fuel infrastructure which includes a refuelling plant at NCT’s Parliament Street Garage. Roadgas produces bio-gas through anaerobic digestion of food waste, farm waste and sewage – the process of breaking down solid waste and converting it into gas. The methane emitted from this process is turned into fuel and injected into the National Gas Grid via a pipe. A second pipe will transport the gas to the new Parliament Street garage, from the grid, and it will be pumped into the buses each night.